If you have ever been fortunate enough to see the Notting Hillbillies you may well have heard Brendan Croker introduce the Mark Knopfler song Why Worry as “Why Bother.” And, I must admit, in thinking about writing a biography of Mark I have many times asked myself the same question – why bother ? What could possibly be said about Mark Knopfler, his songs and guitar playing, that has not been said a million times already ? But, then, just recently, I received an e-mail from a fan in Thailand asking for biographical information on Mark Knopfler so I guess there are some folks out there who still need to know what I thought every fan knew already. So, here goes…. Mark Knopfler was born in Glasgow, Scotland, on the 12th of August 1949. He was around seven years old when the Knopfler family moved to Newcastle-Upon-Tyne in the North-East of England. Mark attended Gosforth Grammar School. As a young boy Mark was inspired by his uncle Kingsley’s harmonica and boogie-woogie piano playing. Later, in his teens, he set his heart on an all too expensive flamingo-pink Fender Strat, just like Hank Marvin’s, but in the end he had to settle for a £50 twin pick-up Hofner Super Solid and £50 was a lot of money in those days. Like lots of other guitar-toting schoolboys of the 1960s, he served an early apprenticeship by forming and joining anonymous schoolboy bands and listening to guitarists such as Scotty Moore, Jimi Hendrix, Django Reinhardt and James Burton. At sixteen he made a local TV appearance as half of a harmony duo along with school-friend Sue Hercombe. Steve and Mark found that musically they had much in common and they went on to form a duo called The Duolian String Pickers. By day Mark continued working as a reporter and, later, as a full-time student, while Steve took a job restoring paintings and furniture at Leeds City Art Gallery and Temple Newsam House. They played together on and off over the next five years. Some of their work is featured on Steve’s 1996 Just Pickin’ album. “He was a good guitar player”, Steve says wryly of the young Knopfler, “in a B.B.King sort of way.” Steve was to have a profound affect on Mark’s guitar playing introducing him to the intricate lead technique of black blues guitarist Lonnie Johnson and the subtle skills of country blues guitar, the elements of which Mark was eventually to weave into his own unique style of guitar picking. This was, in fact, a very important stage in Mark’s development as a guitarist. He was later to tell Jack Sonni that it was not until he began to finger-pick that he found his guitar ‘voice’. While living in Leeds Mark made his first record. It was recorded in a room that had been converted into studio in a house in Pudsey. The song was called Summer’s Coming My Way and it featured Steve Phillips on twelve-string guitar. On graduating from Leeds University in 1973 Mark decided to go to London and try to break into the rock scene. He scanned through the music press and finally answered the biggest advert he could find in Melody Maker. That led him to an audition and a two month stint with a blues band called Brewer’s Droop. Mark played guitar on three songs they recorded at Dave Edmunds’ Rockfield Studios in Wales. The band’s drummer was a guy called Pick Withers. Pick had turned professional at the age of seventeen and was a very experienced drummer. Having left Brewer’s Droop Mark took up a job as a lecturer at Loughton College in Essex where he remained for two years living in a rented flat in Buckhurst Hill, sometimes giving guitar lessons at Staples Road School. Then brother David came to stay for a few weeks en route to London. The Knopfler brothers would often sit up late into the night playing songs and, without knowing it, to some extent laying the foundations of what was to become, in time, Dire Straits. It was the mid-1970s, David moved on to London and Mark went on to form a working band with friends at Loughton College. They called themselves the Café Racers. David came to share a flat at Farrer House on Deptford’s Crossfield Estate, South-East London, with a Leicester-born bass player by the name of John Illsley. John recalls first meeting Mark. “I’d been out all night and came in about ten in the morning. I walked into the kitchen, started making myself a cup of tea, walked into the lounge and there was this guy lying on the floor with his head propped up against a chair. He was fast asleep, fully clothed in denim with leather boots. He had a guitar slouched over his waist.” David had often spoken to John of his guitar-playing brother and John guessed correctly that the guy sprawled out on the lounge floor was indeed Mark. It wasn’t long before John found himself on stage with Mark. One night the Café Racers’ bass player was ill and John was asked to stand-in. Mark and John immediately struck up a great working relationship and both realised that, despite having built-up a good reputation on the local pub scene, the Café Racers had a limited future. In April 1977 Mark gave up his flat in Buckhurst Hill and moved in with David and John. John quickly realised that not only was Mark a talented and excitingly different guitar player, he was also a gifted song-writer. During the summer of 1977 the three musicians found themselves playing and rehearsing Mark’s songs. Yet, something was missing – a drummer. Mark, recalling his brief stint with Brewer’s Droop, said he knew of a drummer who would be ideal for the sort of music they were developing. Mark had been very impresssed with Pick Withers back in 1973 and so Pick was invited to the Farrer House flat and the four musicians began doing gigs together under the name of Mark’s old band, the Café Racers. John recalled that “playing with Pick Withers was fantastic…I’d never played with anybody as good as him.” Later, a friend of Pick’s suggested a new name for the band – Dire Straits. The die was cast. The band’s first gig took place on the open space at the back of the Farrer House flats, the electricty provided by a power cable running from the stage into a socket on the wall of John’s first floor flat. Punishing rehearsals and live gigs followed. There was just enough room in the back of John’s estate car for the band’s equipment and they earned just enough money to pay for PA hire and a round of beers. On the 27th of July 1977 Dire Straits recorded the now famous demo tapes of five songs – Wild West End, Sultans of Swing, Down To The Waterline, Sacred Loving and Water of Love. In what was probably October they recorded Southbound Again, In The Gallery and Six Blade Knife for BBC Radio London and, finally, on the 9th of November demo tapes were made of Setting Me Up, Eastbound Train and Real Girl. Many of these songs reflected Mark’s experiences in Newcastle, Leeds and London, and were to be featured on the first Dire Straits album the following year: Down To The Waterline recalled images of life in Newcastle; In The Gallery is a tribute to a Leeds sculptor/artist named Harry Phillips, father of Steve; and, Lions, Wild West End and Eastbound Train were all drawn from Mark’s early days in the capital. The demo tapes were given to BBC Radio London DJ Charlie Gillett. Charlie played the tapes calling upon record company executives to sign this new band: enter John Stainze and Ed Bicknell. It is said that Phonogram A&R man Stainze was in the shower listening to the radio when he first heard Dire Straits. A few weeks later he signed the band to Phonogram’s Vertigo label and Mark secured a publishing deal with Rondor Music. Towards the end of 1977 Ed Bicknell was working at the NEMS agency when he got a call from Stainze asking him to fix up some gigs for Dire Straits. Ed was invited round to Phonogram’s offices in December where he heard the Charlie Gillett demo tapes. He was then taken to Dingwalls Club in North London to meet Dire Straits. The date was the 13th of December, 1977, and as he walked into the club they were playing Down To The Waterline. Ed recalls, “The first thing I noticed was that it wasn’t necessary to stand at the back of the room; they were very quiet. I’d just done The Ramones, who were deafening……The second thing I noticed was that Mark was playing a red Stratocaster, which immediately made me think of Hank Marvin, who I had idolised in the sixties.” After hearing two or three numbers Ed decided that he wanted to manage the band. He was organising a tour for Talking Heads and was able to put his new band on the bill as the support act. Dire Straits were paid £50 per night for the Talking Heads tour; a ten-fold increase from their fee at Dingwalls. The rest – as is often said – is history. I once asked Ed Bicknell’s former assistant, Liz Whatley, when it was that she realised Dire Straits were going to be really big. She replied that it was the first time she heard Romeo and Juliet. By the mid-1980s Dire Straits had released Brothers in Arms, one of the best selling albums of all time, and had been tagged ‘the biggest band in the world’. By that stage the recording and touring personnel of the band had changed more than once. David left. Hal Lindes, guitar, and Alan Clark, keyboards, joined. Then came Tommy Mandel, keyboards, and Mel Collins, saxophone. Pick left and was replaced on drums by Terry Williams. Keyboard player Guy Fletcher became a member of Dire Straits for the Brothers In Arms album. Jack Sonni, guitar, and Chris White, saxophone, were brought in for the subsequent world tour. By the time Dire Straits commenced the 1991/92 On Every Street tour Mark, John, Alan, Guy and Chris were left from the mid-80s line-up. They were joined on stage by Phil Palmer, guitar, Paul Franklin, pedal-steel guitar, and percussionists Danny Cummings and Chris Whitten. Others who have been featured on Dire Straits’ recordings include Roy Bittan, keyboards, and Joop De Korte, drums. The Brothers In Arms tour saw Dire Straits play 234 shows in twelve months to combined audiences of about 2.5 million. Within a couple of weeks of the tour finishing Mark was producing Tina Turner but, at the same time, felt he needed to get back to his roots. Long-time mates Steve Phillips and Brendan Croker had teamed-up to form a duo shortly after Mark had left Leeds in 1973. In 1986 Steve was in London and called in to see Mark who said he fancied coming up to Leeds and sitting in with Steve and Brendan on one of their gigs. This resulted in the three of them playing together at The Grove pub in Hunslet, Leeds, on the 31st of May, 1986. The following year Mark offered to produce Steve’s next album but Steve suggested that a new album should feature both himself and Brendan. Guy Fletcher was brought in to help out on the technical side. From this evolved the Notting Hillbillies. Ed Bicknell is an accomplished drummer in his own right and during a meal in a Notting Hill wine bar, Mark sat next to him and said “OK, Ed; we’ve formed a band, and you’re the drummer.” Paul Franklin joined on pedal-steel guitar. There followed an extensive UK tour to promote the 1990 release of the multi-platinum selling album Missing……Presumed having A Good Time. Also in 1990 Mark was able to release the Neck and Neck album, a joint project with the greatly admired Chet Atkins. Mark brought Dire Straits back together for the 1988 Nelson Mandela 70th Birthday Concert which featured Eric Clapton who was standing-in for Jack Sonni as Jack had just become the father of twin girls. Mark, John, Alan and Guy appeared on stage at Knebworth in June 1990 along with, among others, Eric Clapton, Elton John, Ray Cooper and Phil Palmer, to help raise funds for the Nordoff Robbins charity. Then came the On Every Street album. The resulting extensive world tour, which played to more than four million people, was punishing and exhausting. After it was over Mark felt that he needed to take a break from the pressures of live performance and studio schedules. Over the years Mark has collaborated with many artists. He has at one time or other worked with people such as Bob Dylan, Van Morrison, Randy Newman, Buddy Guy, Tina Turner, Phil Lynott, Willy DeVille, Eric Clapton, Waylon Jennings, Chet Atkins, Phil Everly, Vince Gill, Paul Franklin, Kate and Anna McGarrigle, Paul Brady, The Chieftains, Ben. E. King, Mary Chapin-Carpenter, Joan Armatrading, Scott Walker, Jeff Healey, The Judds, Jimmy Nail, Bryan Ferry, Aztec Camera, Steely Dan, Sting, Sonny Landreth, James Taylor, Emmylou Harris, Gillian Welch and David Rawlings. He has also devoted a great deal of time to charity work for institutions large and small. Dire Straits did a total of three concerts for the Prince’s Trust in front of Prince Charles and Diana, Princess of Wales. They appeared at the 1985 Live Aid Concert and the 1988 Nelson Mandela 70th Birthday Concert. In 1995 Mark was featured on the chart-topping Dunblane single Knockin’ On Heaven’s Door and in September 1997 was one of the artists who performed for Sir George Martin’s Music For Montserrat Concert at the Royal Albert Hall. The Notting Hillbillies, too, have performed many charity concerts helping to raise money for a range of deserving causes. Mark also found time to score the music to numerous films. First came Local Hero in 1983 followed in 1984 by the Cal and the Comfort and Joy soundtracks. These were followed in 1987 by The Princess Bride and two years later came Last Exit To Brooklyn. Further soundtrack work has seen the release of Metroland and Wag The Dog, both of 1998, and the soundtrack album to the film A Shot At Glory released in 2001. In 2016 Mark collaborated with Evelyn Glennie for the soundtrack to the film Altamira. In 1996 Mark began his career as a solo performer with the release of the Golden Heart album. The album was simply a step forward in the evolution of his music, “It’s just moving forwards…”, he said, “… just trying to be better.” Mark’s solo career has allowed him to hone his rare talent as a singer/song-writer. His second solo album, Sailing To Philadelphia, was released in 2000. Autumn 2002 saw the release of his third solo album, The Ragpicker’s Dream, but, just as rehersals were about to begin, the planned 2003 tour had to be cancelled due to a serious motorcycle accident. Thankfully, Mark made a full recovery from his injuries and was on the road again in 2005 to promote his fourth solo album, Shangri-La, released in September 2004. One year on saw the release of The Best of Dire Straits and Mark Knopfler: Private Investigations compilation album. 2006 has seen the release of a number of albums to which Mark has contributed and also of the much acclaimed and Grammy nominated All The Roadrunning CD with Emmylou Harris promoted by a tour of Europe and North America. 2007 saw the release of another solo album, Kill To Get Crimson, followed by a 2008 promotional tour of Europe and the USA. Mark’s sixth solo album, Get Lucky, was released on the 14th of September, 2009, another North America/Europe tour followed in 2010. Autumn 2011 saw Mark and his band undertaking a short European tour with Bob Dylan with a similar tour taking place in North America late-2012. The double CD Privateering, was released on the 3rd of September, 2012, with a European tour to follow in 2013. 2015 sees the release of a ninth solo ablum*, Tracker, with concerts in Europe and North America. Mark has been the recipient of countless awards and accolades from Grammies to an OBE. In May 1993 he was conrerred with an Honorary Doctor of Music Degree by Newcastle University of which he is justly proud. He also has honorary music doctorates from the universities of Leeds and Sunderland. In 1999, Mark was awarded an OBE (Order of the British Empire) in the Queen’s Honours List. In 2001, British scientists named a dinosaur they discovered after him: the dinosaur, which was discovered in Madagascar, was named “Masiakasaurus Knopfleri.” Many more honours have followed such as an ARPS Sound Fellowship (2009) bestowed on individuals who have made a “significant contribution to the art, science or business of sound recording”, a PRS Music Heritage Award (2009) and an Ivor Novello Lifetime Achievement Award (2012). There remains another side to Mark Knopfler, a private side. By the mid-80s Mark was being referred to by some as the “quiet man of rock and roll.” Shy by nature, in some ways Mark has tended to shun fame. He gets embarrassed when fans tell him how much they have been affected by his songs and how his music has changed their lives. It is a matter of public record that Mark has been married three times. His second marriage produced his twin sons, Benji and Joseph, born in 1987, and his third marriage to Kitty Aldridge has been blessed with two daughters, Isabella, born in 1998, and Katya born in 2003. 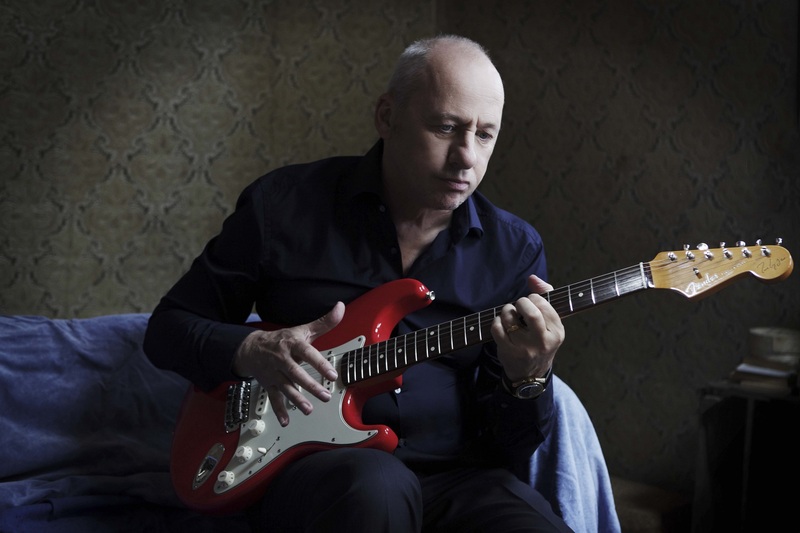 After more than thirty years at the top of his profession, Mark Knopfler remains at heart a family man who loves nothing better than to spend time with his wife and his children. Want to see more Biogs?